The Incredible Spinning Card: The magician throws a borrowed credit card several feet away and it hovers in MIDAIR without the magician or spectator any where near it. On the magician's command, he is able to cause the spinning card to fly back to him, as fast or slow as he wants! Includes how to get the spinning card to float through a spinning hoop. In The Air Change: Imagine showing a small piece of paper with a dollar sign drawn on it. The magician crumples the paper into a ball and it begins to levitate. The magician can walk away from the floating ball and go to his case to retrieve a lighter. 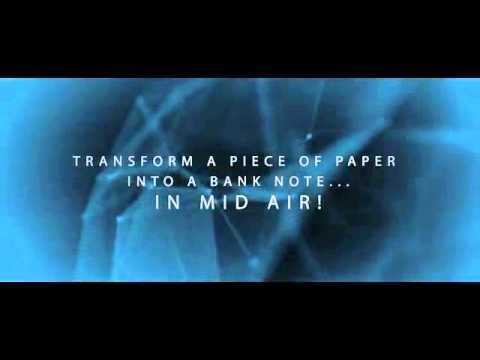 He burns the floating ball to reveal a bank note in its place, STILL FLOATING IN MIDAIR! Includes how to use the In The Air Change to produce and float a borrowed, vanished finger ring at any point. Floating Bill: You think you know, but you have no idea. A borrowed bank note is crumpled into a ball and levitates. It floats inexplicably from hand to hand. You can then borrow a hoop earring or a bangle from a lady and pass it around the bill before handing the bill back to its owner. "This looks amazing, I love it so much when I get fooled! Defiance brings back memories of why I became a magician in the first place…I thought I knew every system and hookup but I have no clue of how he does what he does!" For more magic by Giovani Goni click here.